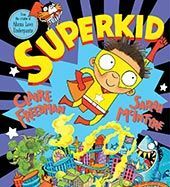 I wasn't up for the award this year; the reason that organiser Rosie Pike asked me to present the awards is that I'd been the one to accept the very first award, way back in 2010, for my book with Giles Andreae, Morris the Mankiest Monster. 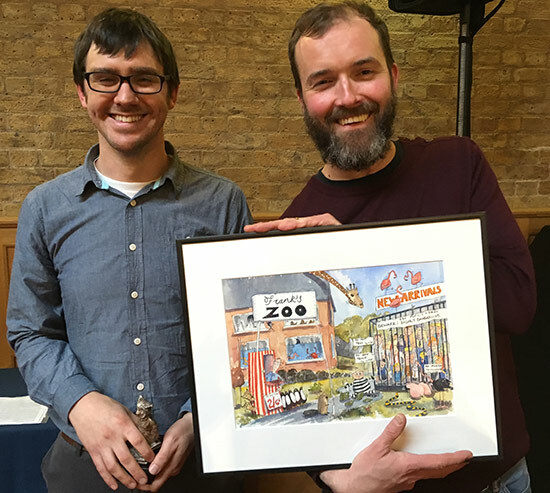 Here you can see the then-Children's Laureate Anthony Browne presenting the award along with a painting to commemorate the occasion by local artist Simon Bailey. And a year later, when Giles joined me to present the second award. Here you can see all the past winners. 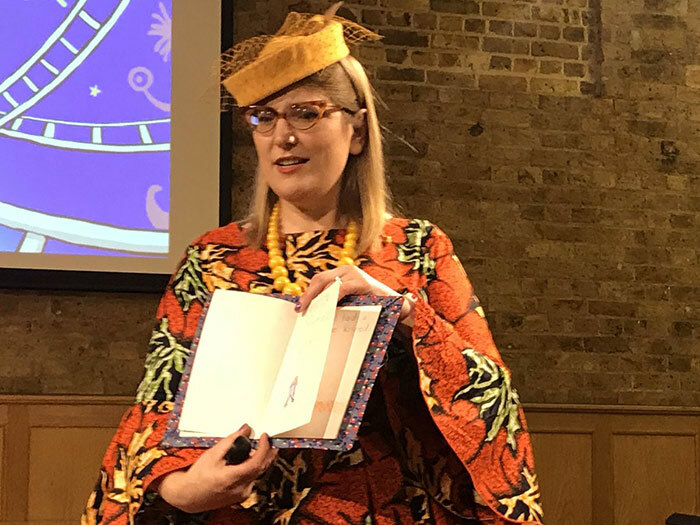 Rosie and the festival team really understand about the role illustrators play in creating these books and do a great job putting them right in the centre of the ceremony. 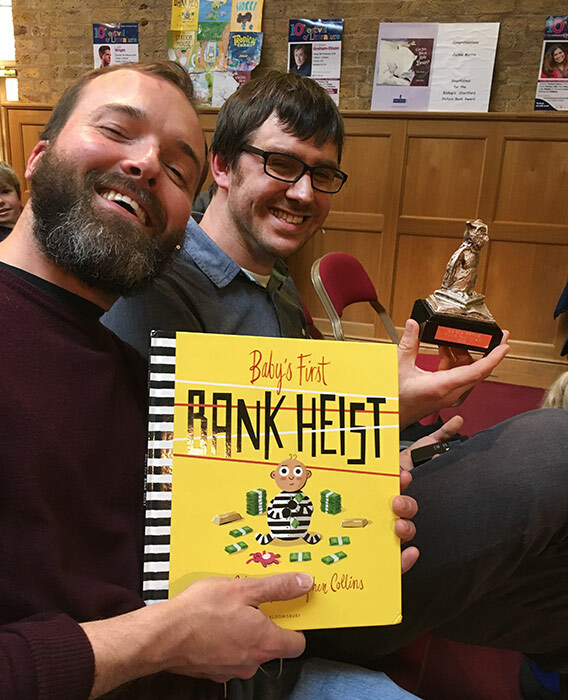 Here's a photo tweeted from the festival account - @BSCFestLit - of the dramatic moment right before the announcement... And all the children in the audience, who had voted for the award, met the results with wild applause and cheering! Here they are on stage, talking about what went into making the book and hinting at the follow-up book they'll be publishing with Bloomsbury. 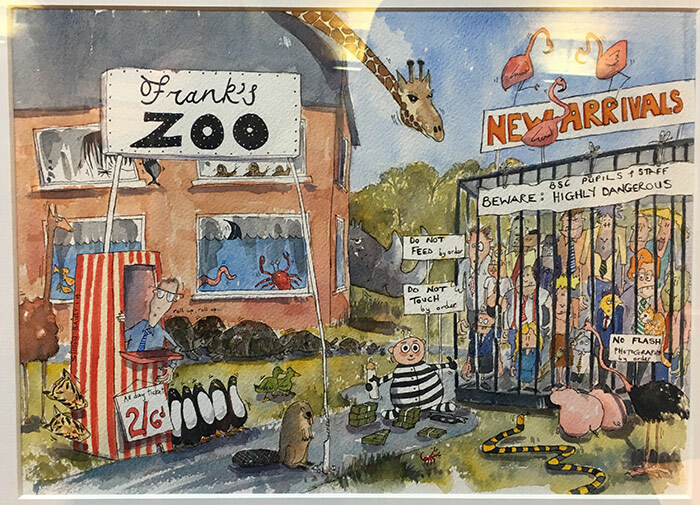 Every year Simon Bailey paints a picture in honour of the latest winning book. 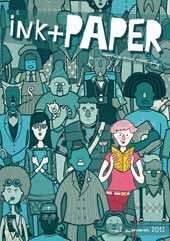 For the first two years he drew pictures of the actual writers and illustrators, but it was rather tricky as he hadn't met us yet. 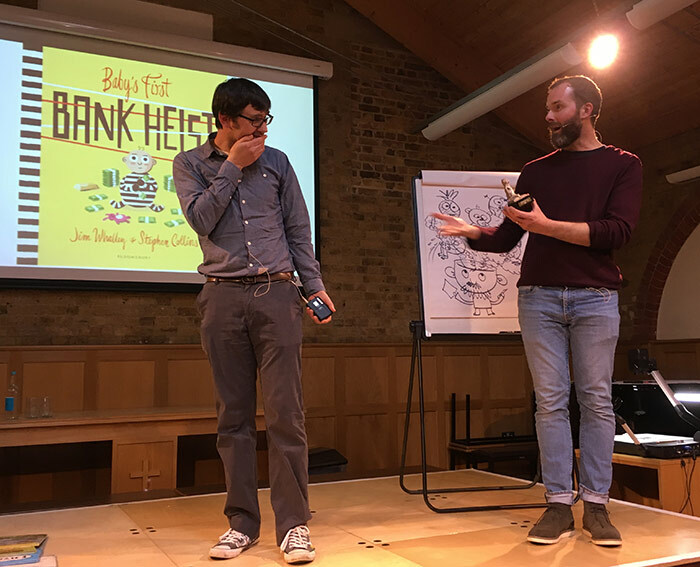 So he didn't realise just HOW much taller I am than Anthony Browne, or that second-year winner Sue Hendra has one leg. 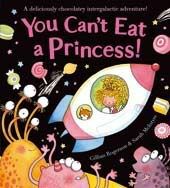 Illustration can be quite fraught! From the third year, he focused on playing with elements of the books themselves, and all the pictures hang proudly in the school library. 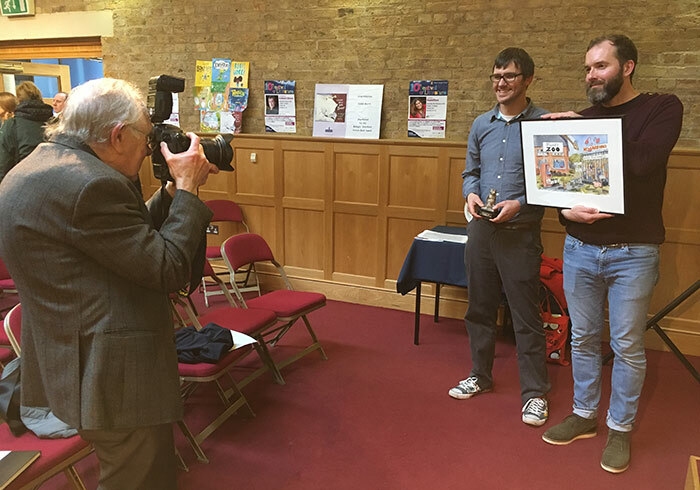 The first one was a picture book event, featuring my two most recent picture books, Dinosaur Firefighters and The New Neighbours. 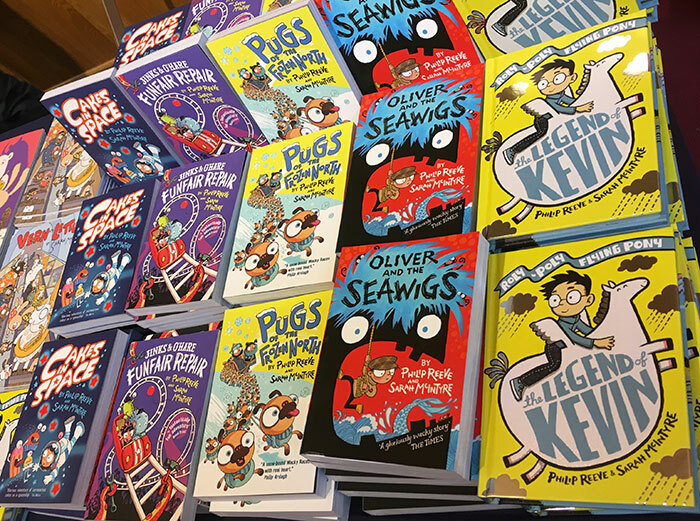 Check out this amazing book spread put out by Tom Hunt from the Norfolk Children's Book Centre! 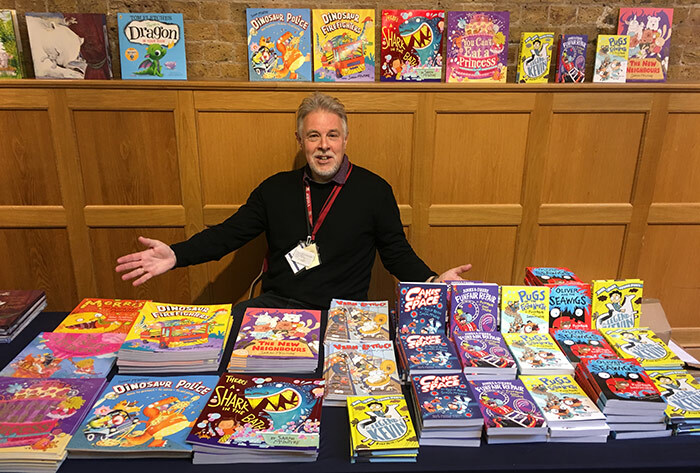 Tom and Lynn Bailey both did a great job of connecting children with books over the two days. 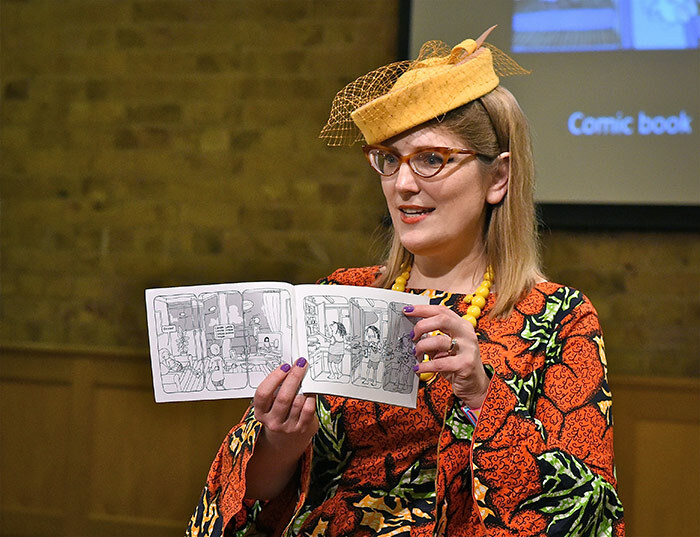 Philip Reeve took this photo of me looking at the amazing drawings the kids had done of two of my characters (a diplodocus and a bunny). 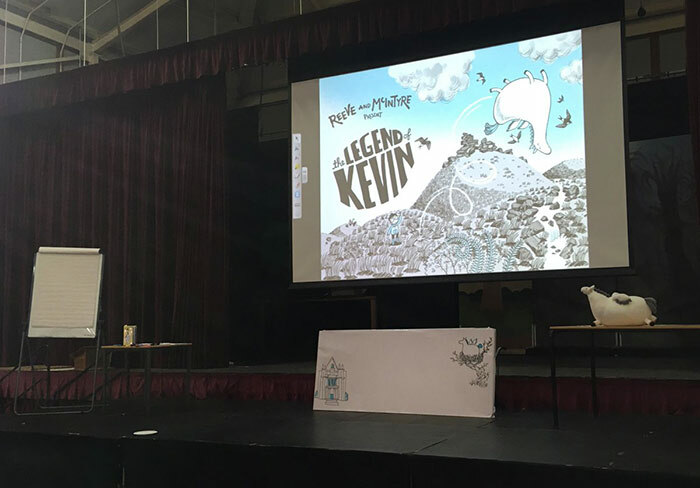 I don't usually do that many events for grownups, but this time I did a special evening session on how to make picture books, talking about how I do it, book layouts, and how to get into the business. Here's a little peek at the cover of the printer proofs of a picture book I have coming out on May 2nd, called Grumpycorn. And here's the first book I ever made, carefully saved and put into a hand-sewn cover by my mother. It's called My Fish and is inspirationally random and boring. So if anyone wonders if I was some sort of child prodigy, they can look at this and take hope that anyone can learn how to make a book with enough practice. (I'm very fond of My Fish!) 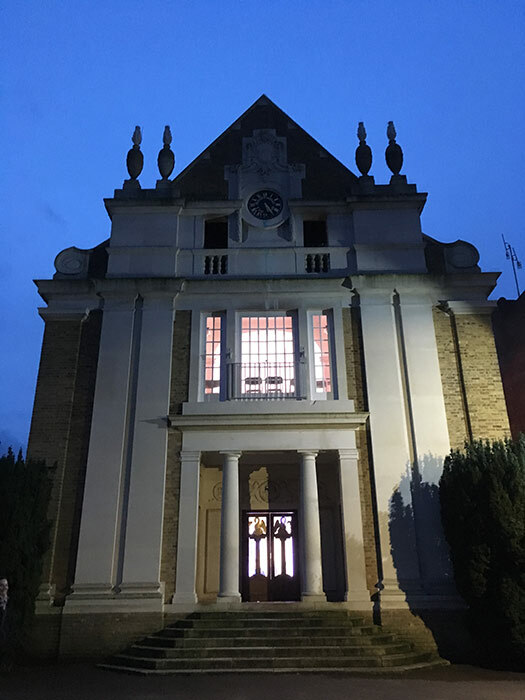 These two photos were tweeted by Emma Vandore - @Emmissima - who had recently finished the online Curtis Brown Creatives course I filmed with my Jampires co-author David O'Connell. 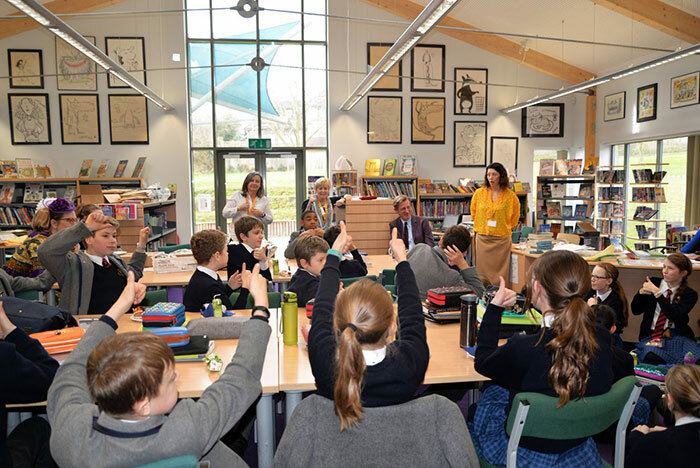 After our second event, Philip went to the library for a lunchtime book club, discussing his very first novel, Mortal Engines. 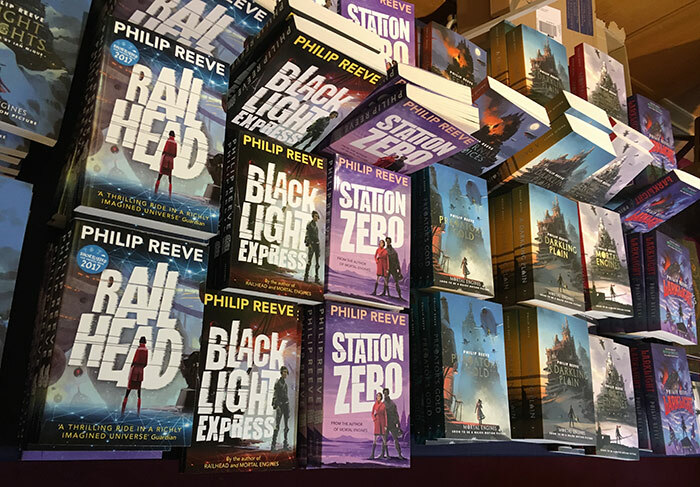 Then Philip was whisked away for a big event about his own books, including the Mortal Engines quartet and the Railhead trilogy. He did some terrific readings from Railhead with video and music composed by Sarah Reeve. 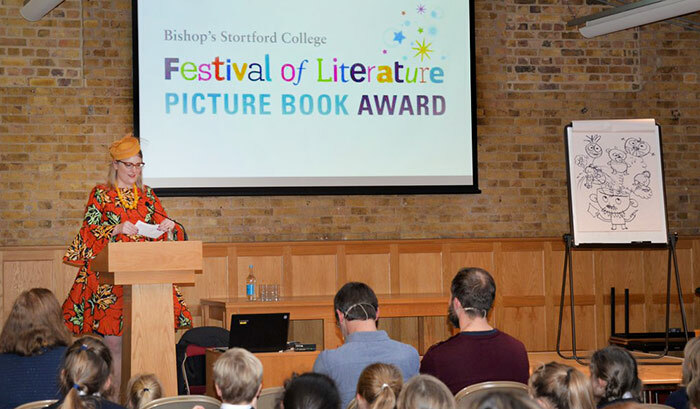 Big thanks to Rosie Pike, senior school librarian and picture book award coordinator Maggie Garrett, and all the festival team and booksellers for hosting us! And a special congratulations to Rosie for her TENTH year organising the festival - I hope she gets a good rest after this is all finished! 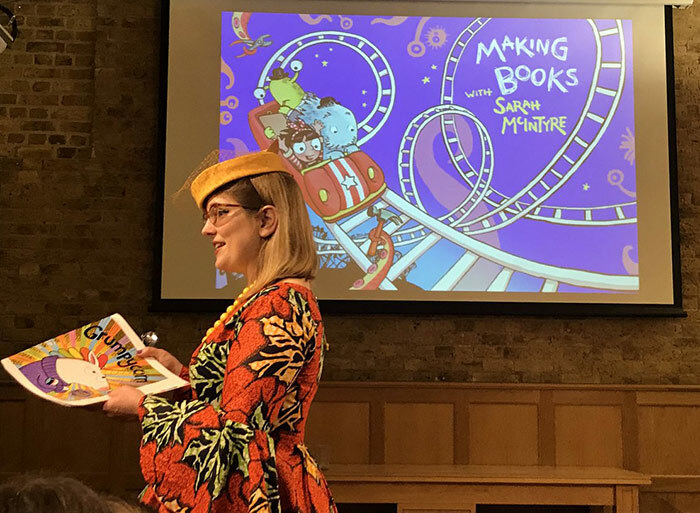 The 6th of February saw Sarah McIntyre, a published children’s books illustrator and author, at the Festival of Literature. 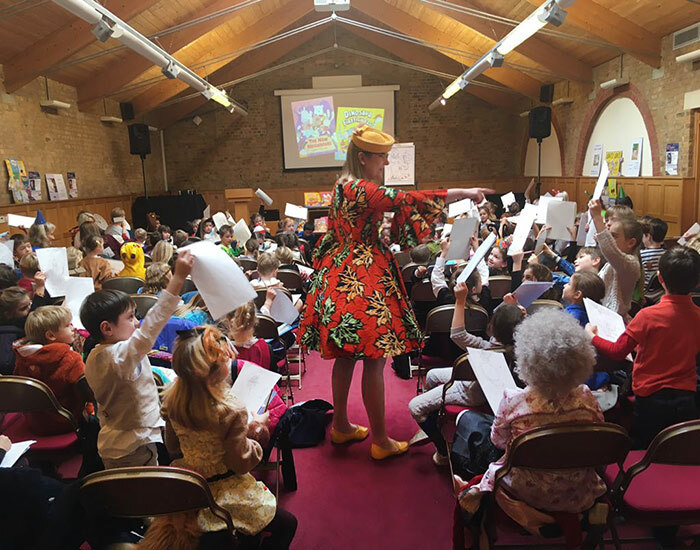 This fun packed session was full of top tips of her career journey from her very first comic book about her dead goldfish, to her soon to be published picture book, Grumpycorn. 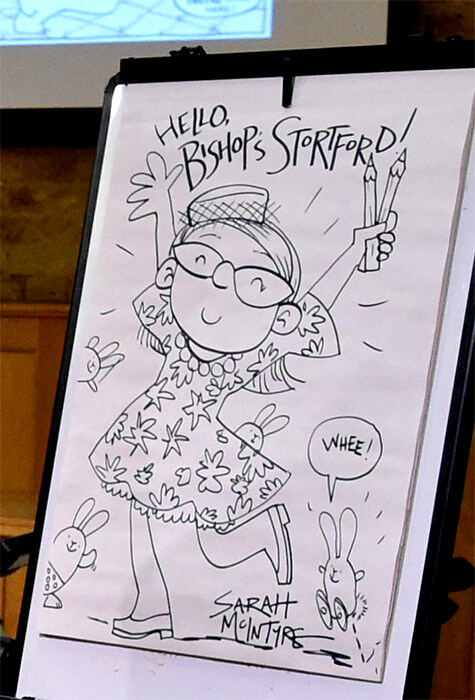 Sarah took the audience on a whistle stop tour of how her characters are first sketched out, to the final glorious fluorescent pages visible in her books. 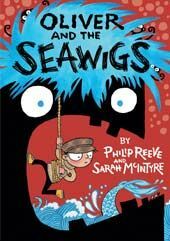 Her characters are engaging for children, such as her Dinosaur Firefighters and The Prince of Pants with huge detail in every page of beautifully formed artwork. 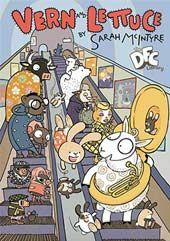 “Writing is quick, but drawing is slow!” exclaimed Sarah when talking about her work. She used the comparison of drawing to playing the piano. “You cannot stand in front of a piano and expect to start playing Beethoven, so you cannot expect to start drawing brilliant pictures, without the practice”. 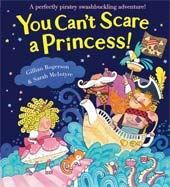 One part of the talk I found particularly captivating was her view point on the size of picture books, relative to her target audience- something that one would not necessarily consider. 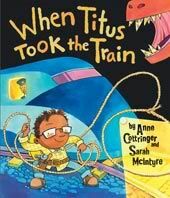 She mentioned how picture books should be so engaging for a child, since they literally wrap the child in the book, making them become a part of the story. 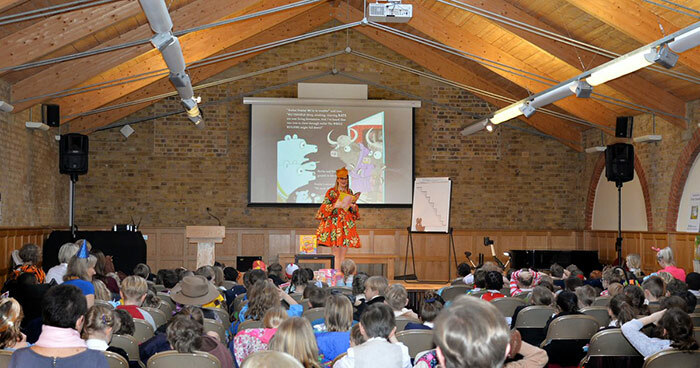 With the session ending, I am sure that every audience member was rushing home to start making their very own books. 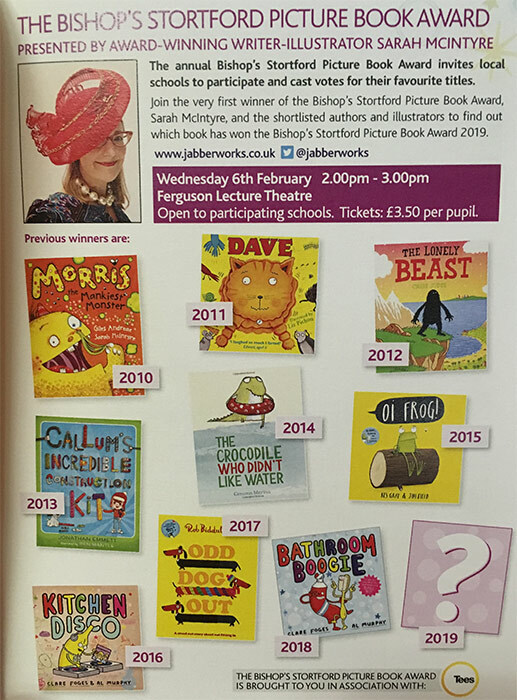 Thank you very much to Sarah McIntyre for such an enjoyable evening and to the Bishop’s Stortford College Festival of Literature for hosting it.